More spices at the Medieval Market of Súria. Remember I showed you turmeric or tumeric in a past post, today you can see madras curry, cayenne pepper, some varieties of tea among others. those tiny boards are interesting. and for me, those spicies are mysterious. they could make the food very tasty. wonderful plants and clever cook!! I love the colors in this photo. It looks so festive. Shows really well for the holiday season. Thanks for sharing it. 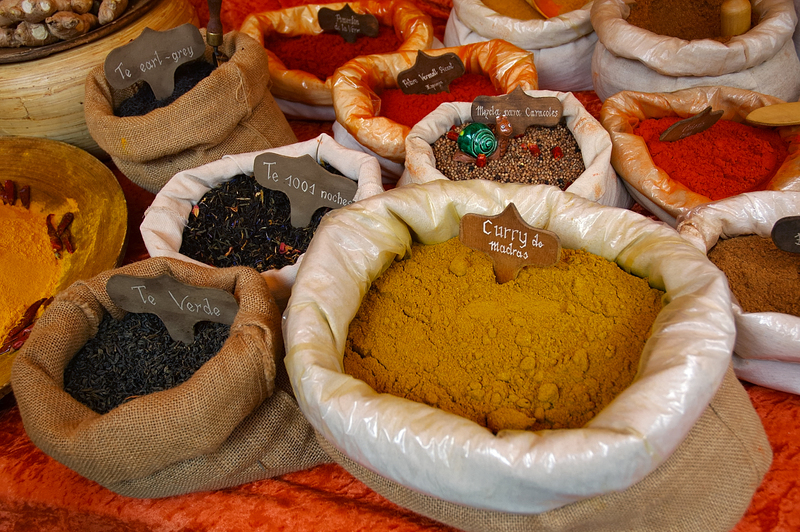 A great array of spices and interesting colours. Curries are so wonderfully complementary to food, aren't they? I remembered your tumeric photo from last month the colors are outstanding. The smell must be rich. Watch out for that little snail! em sembla olorar-les, com m'agraden, l'olor, el color, el sabor i en primera linea la meva preferida, el curry. Spices and teas...I like the both! Nice colors. Have a nice week end, Carlos! If the wind gets up you will end up with curry flavoured tea! Thnks everybody. I am still replying from the office and obviously I don't have much time but I am much obliged to all of you who in spite of my lack of response due to connection difficulties still come by and drop me a line. I have managed to answer some of you but I have to devote the short amount of time I have to posting which as you see is done late and out of schedule. I promise I will compensate for that as soon as everything is back to normal. Beautiful tones in your photos.